Oklahoma Governor Kevin Stitt names Ada resident Mike Jackson to the Oklahoma Veterans Commission (OVC), serving as at-large member of the board, beginning July 1. The OVC oversees the state’s Department of Veterans Affairs, providing the highest quality services and health care for Oklahoma veterans and their families residing in the state. The OVC is composed of nine members, with three members being Vietnam veterans and one member a Gulf War veteran. Mike and Lori Jackson, Associate Judge of the 22nd District Court (Ada), were married in 2011. They attend St Luke’s Episcopal Church. Jackson has two daughters and three grandsons. He is a member of the Delaware Tribe of Indians. David Keith (l.) congratulates Mike Jackson for his appointment by Governor Stitt to a three-year term as a member of the Oklahoma Veterans Commission, the nine-person state board that oversees the Department of Veterans Affairs that provides services for veterans and their families residing in Oklahoma. Both Jackson and Keith are senior executives at the Oklahoma Heritage Bank. Many months ago at a somber Pontotoc County Sheriff Auction, Oklahoma Heritage Bank (“OHB”) was the solitary bidder that retrieved a two story place of Christian worship in Ada’s West 7th Street neighborhood. The once-proud landmark church, perhaps a hundred years old, was abandoned and lifeless, after having served churchgoers for several generations in the northwest section of Ada. OHB began an exhaustive cleanup and repair of the massive old church, restoring the physical structure of the 3200 square foot building complete with a 250 person sanctuary and open baptistery. The yearlong cleansing included the first floor kitchen, galley, and classrooms, then a clean coat of light gray/white paint freshened the exterior brick. The bank had given it a new look but the church remained cold, still, and melancholy despite its makeover. It was then, just before last Thanksgiving, when Pastor Charlene Parker Blue and her husband Billy Andrew Blue, Jr. found themselves powerfully drawn to this northwest Ada neighborhood where it seemed so many of the homes had also fallen from grace. With prayer guiding them, the Blues sought advice and help from the banking staff at the Ada branch of OHB. A lease-to-own arrangement was soon crafted, and the Under the Blood Ministries (“UTB”) held its first worship service in this sanctuary on Sunday of last Thanksgiving weekend. 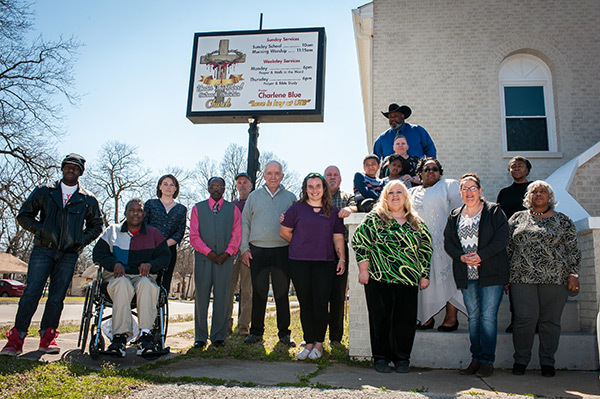 “God has tremendously blessed us to bring UTB to 401 W. 7th street in Ada,” said Senior Pastor Charlene Blue. A Hugo native, Charlene comes from a ministerial background, her father and brother also being pastors. “I accepted Christ as my Lord and Savior when I was nine-years-old,” she said. Charlene graduated with an Associate Degree in Vocal Music from Eastern Oklahoma State College in 1991 and has worked for Ada City Schools since 2005. Her husband, Ada native Billy Andrew Blue Jr., is the Evangelist Minister with UTB Ministries. Billy accepted Jesus Christ as a young teenager and later was ordained a Deacon in the Baptist Church. Billy has worked for the City of Ada for 15 years. UTB Outreach Ministries was born of a need to support the Fellowship of Women in Christ ministry that originated in 2005 to help women develop their God-given purpose. In 2008, Girls of Destiny, a ministry for girls, was similarly created and was followed in 2010 by Boys of Purpose, devoted to the spiritual needs of boys. UTB Outreach Ministries originated in Ada during a revival of these Fellowships held at The Source Center in 2013. Charlene was ordained as the Pastor of UTB Outreach Ministries in 2014. The Vision of Under The Blood Outreach Ministries Church is Kingdom building ministry that disciples the believer, binds up the broken hearted, seeks out the unchurched and leads them to Christ. The ministry’s motto “Love is Key at UTB!” is a central theme of each week’s services: Sunday School 10 AM; Sunday Morning 11:15; Monday and Thursday evening prayer services 6 PM. Wednesday evenings feature Fellowship meals at 5pm and worship services at 6pm. The church hosts guest pastors each first Sunday. Revivals, fundraisers, and community events are scheduled for this spring. Oklahoma Heritage Bank and Under the Blood Outreach Ministries bring life back to centennial landmark. Left to right front row. Nigel Harris, Tony Shelton, Destiny Rosato, Billy Blue, John Vaughan( behind), Dr. Darryl Fisher, Kathleen LanCaster, Barry LanCaster (behind) On front step. Robin Steele, Paulette Dickerson, Linda Whelchel. 2nd row Marqele Sandman, Charlene Blue, Denise Harris. 3rd row JaKayla Johnson, Rachel Larry and TL Larry. The Board of Directors of Oklahoma Heritage Bank (“OHB”) has expanded the bank’s executive management team, naming David Keith as Chief Executive officer to succeed Mike Jackson who will serve as Chief of Corporate Development to focus full time on the goals and objectives of the bank’s Strategic Plan-2019 to become the “Go-To” Community Bank in Oklahoma. Keith joined OHB as Chief Banking Officer in early 2018, bringing twenty-one years of community-banking experience to this leadership role at OHB. His additional training has included Commercial Lending School at Southern Methodist University and Oklahoma Bankers Association Consumer Lending and Commercial Lending programs, as well as its Intermediate School of Banking. 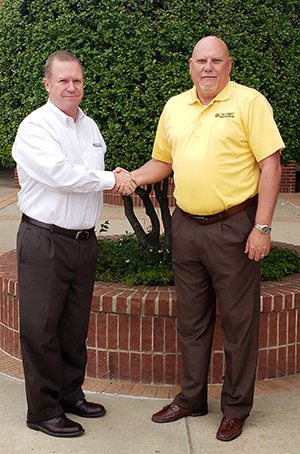 He will work closely with OHB President Dustin Riddle, and Senior Vice-President Chance Branscum in the daily management of all four locations of OHB (Ada, Stratford, Byng, and Roff). “We plan to continue OHB’s impressive growth that the management team has achieved through its community service and its principles of sound banking,” said Keith. Vice-Chairman Eric Fisher commends David’s banking accomplishments, “David’s successful banking career results from his relationship-building skills, his organizational abilities, and his leadership talent. His solid lending experience will continue to enlarge the strong base of community and commercial loans that OHB already provides. And his enthusiasm and work ethic will facilitate OHB’s transition in 2019 to its new facility in North Hills Shopping Center. Keith was born and reared in Ada, attended Ada and Byng Schools, graduating from Byng High School in 1985 and East Central University with a Bachelor of Science in 1990. David and Brandy Keith were married in 2004. They attend Crossroads Church. David has three sons, a daughter-in-law and a granddaughter. He has served on the Ada City School Foundation and Ada Jobs Foundation and was elected President of the Ada Lions Club. Keith’s father was founder and pastor for 43 years of Ada’s Evangelistic Temple church. Jackson will continue as a key member of the Board’s Executive Committee, creating the strategic plans for OHB and collaborating with the staff at all four OHB locations to promote the spirit, philosophy, and service dedication of OHB. After graduating from Roff High School, Jackson served 13 years in branches of the US Air Force and US Army where he graduated from Oklahoma City University with a Bachelor of Science degree. In 1987 he returned to Ada and to a business and banking career. He has attended Consumer and Commercial Lending training programs, as well as OBA’s Intermediate School of Banking. Mike and Lori Jackson, Associate Judge of the 22nd District Court (Ada), were married in 2011. They attend St Luke’s Episcopal Church. Jackson has 2 daughters and 3 grandsons. He is a member of the Delaware Tribe of Indians. “OHB offers a wonderful banking opportunity for friends and neighbors in this area,” says Jackson. “OHB is great example of customer-first and customer-friendly banking. OHB was chartered in 1978, with its first location in Roff. In 1984, the second full-service location was opened in Byng, followed by opening its third location in Stratford in 2003. OHB’s fourth banking location was opened in Ada’s North Hills Shopping Center in 2014. Construction of a new state-of-the-art facility in the North Hills Center, fronting Lonnie Abbott Blvd, will break ground this month.. 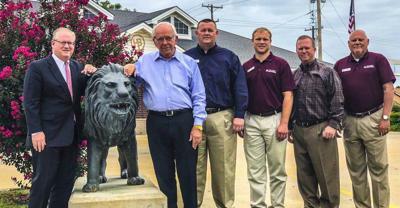 The Executive Committee of the Oklahoma Heritage Bank (Ada, Byng, Stratford, Roff) stand in front of Stratford’s OHB building to welcome David Keith (standing 2nd from r.) as the bank’s Chief Executive Officer and Mike Jackson (r.) as Chief of Corporate Development. At the bank’s bronze lion are Chairman of the Board R. Darryl Fisher, MD (r.) and Vice Chairman Eric S. Fisher, Esq. (l.) Standing (from r. to l.) are Jackson, Keith, Chief Credit Officer Chance Branscum and President Dustin Riddle.